Brooklyn neighborhood connection now open! Today the new and improved Rhine-Lafayette Pedestrian Overpass opened with a ribbon-cutting event in the Brooklyn neighborhood. The new bridge improves access for people biking, walking or using a mobility device to Cleveland High School, Winterhaven School, Grout Elementary, Fred Meyer headquarters, and the new MAX Orange Line station at SE 17th Ave & Rhine Street Station and nearby bus stops. 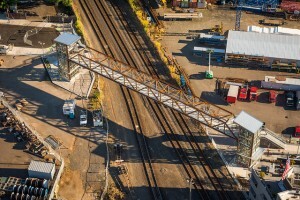 The new overpass replaces an aging pedestrian bridge that was built around 1943 over the Union Pacific Railroad tracks. “This new overpass helps our neighbors cross Union Pacific’s tracks safely and makes the new MAX station accessible to more people” said Mike Eliason, Director of Public Affairs, Union Pacific Railroad. 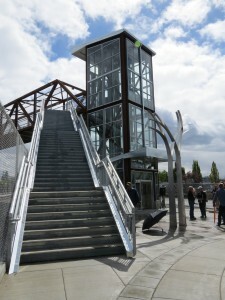 TriMet, the City of Portland and Union Pacific Railroad worked together to build this new structure that includes wider stairs, elevators and public art. • The new overpass alignment at SE Rhine and Lafayette streets lines up with new MAX station and the signalized pedestrian crossing at SE 17th Ave & Rhine. • Bridge span width doubled from six feet to 12 feet; stair width increased two feet to eight feet. • Straighter stairways provide clear sight lines. • Closed-circuit television cameras and improved lighting added. • Bike gutters provide greater ease to move bicycles up and down stairs. • Public art by local artist Anne Storrs titled Along these Lines. The sculpture and paving medallion at the overpass landings draw upon the similarity of trees and root systems to the branching pattern of train tracks. Poetry by Cleveland High School student Monica Arnone and Oregon Poet Laureate Emerita Paulann Petersen are inscribed in stainless steel rings that encircle both pieces. The overpass cost $3.9 million, split between the Portland-Milwaukie Light Rail Transit Project ($2.2 million) and Union Pacific ($1.7 million). The MAX Orange Line will improve transit along the corridor that extends from the terminus of the MAX Green and Yellow lines at Portland State University in Downtown Portland to South Waterfront, SE Portland, Milwaukie and North Clackamas County. • 10 new MAX stations for a total of 97 stations systemwide. • Expands the MAX system to 60 miles. • 10 bus lines will be adjusted to make connections to Orange Line stations and more community connections. • Tilikum Crossing, Bridge of the People, is the first of its kind multi-modal bridge in the U.S. will carry light rail and streetcar trains, buses, bicyclists and pedestrians, but no private vehicles. • 446 new bike parking spaces, including two secure Bike & Ride facilities, at SE Tacoma St/Johnson Creek and SE Park Ave stations. • Two Park & Rides: 318 parking spaces at SE Tacoma St/Johnson Creek Station and 401 parking spaces at SE Park Ave Park & Ride Garage and nine EV spaces with chargers.